Have you ever seen an athlete that looks lazy? In football, they tend to be lambasted by their fans when the result isn't going their way. One of these guys is called Dimitar Berbatov. He's had a great Premier League and international career and is known as a lazy player. 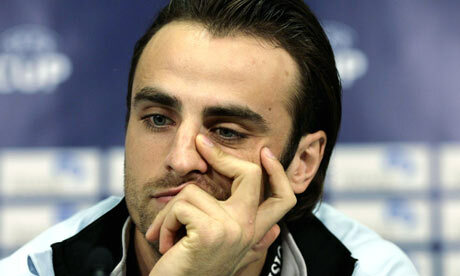 Berbatov works as much as anybody else. His laziness is pure myth. It turns out there is a huge difference between being lazy and looking lazy. Being lazy means not doing the work. Looking lazy means looking like you're not doing the work. In my experience, looking lazy is something to be aspired towards. It is an expression of the minimal effort required to do the level of work being performed. Less effort for the same work means effort left for longer work and other levels of performance...sometimes. Imagine a sprinter who is going absolutely flat out but looks lazy or easy. Their coach may indeed demand more from them that isn't there. The sprinter can then get into conflict with their coach, try to work at supramaximal levels and tire themselves out or feign more effort to please them. Feigning effort actually requires effort so the sprinter sprints worse to satisfy this widespread cultural need to make it look like we're constantly trying our hardest and pushing ourself. Very few people take pride in being a slacker, right? Taking action so we are being seen to be working hard takes us away from what we want as athletes: exceptional performance. "As skill improves, the appearance of effort should reduce." Look at the greats in any sport and you'll almost universally find this to be the case. Looking lazy while working hard is a mark of grace, efficiency, ease and intelligence. At the two ends of the spectrum, you can be pedal to the metal in a Ford Focus feeling like the axel is going to snap or just cruising...in a Buggati...at 190mph. Being better means things look easier and are easier. Newer:THE ATHLETIC DICTATORSHIPOlder:WHAT DOES THE SKELETON SAY?